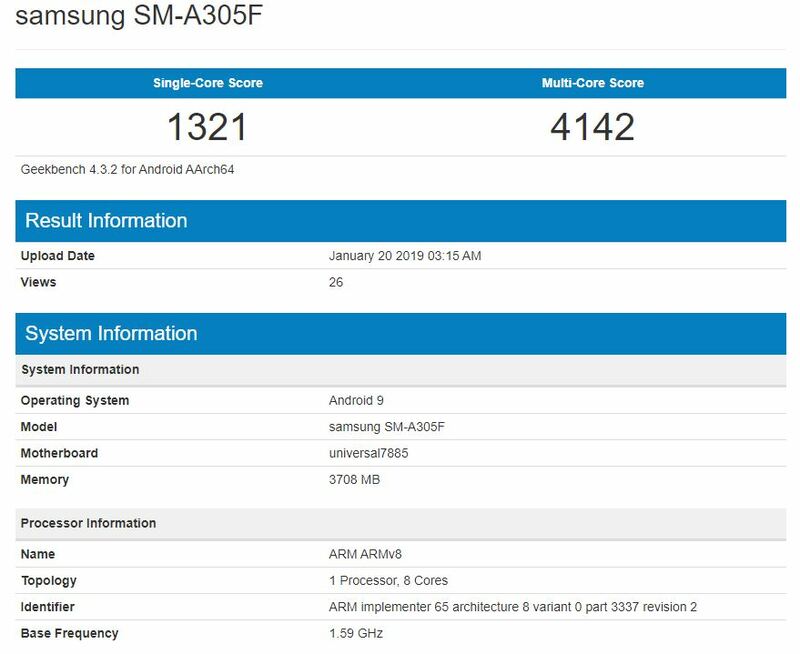 One of Samsung’s upcoming Galaxy A series smartphones, the Galaxy A30 (SM-A305F), has surfaced on the Geekbench benchmark website. Samsung is readying a flood of A series phones, and the Galaxy A30 will sit somewhere near the bottom rung. That doesn’t mean it will be a weak device, as the benchmark reveals it will be powered by the Exynos 7885 SoC, the same chip that powers the Galaxy A8 (2018) and Galaxy A8+ (2018). The Exynos 7885 will be seen on the Galaxy A40 as well, along with the upcoming Galaxy M20. It’s going to give way to the Exynos 9610 as Samsung’s top mid-range Exynos chip, and on the A30, it is paired with 4GB of RAM according to the benchmark. As we had exclusively revealed, the A30 will come in 32GB and 64GB storage flavors, but whether both will have 4GB of RAM remains to be seen. And last but not the least, the A30 was benchmarked running Android Pie just like all other upcoming Galaxy A series phones. There is no word on when any of these new Galaxy A smartphones will be announced. They aren’t likely to hit retail before the Galaxy S10, because Samsung tends to make its newest flagship the first on the market with the latest version of Android out of the box. Our sources have told us that Samsung is likely to make nearly 10 of these official in the first half of 2019, but we’ll have to wait for more details to get a clearer picture of Samsung’s plans. Good to see the smaller a series model have a soc that performs pretty well. I wonder how big the screen will be?. Confused with the inclusion of the a40 and a60 models. I liked old naming scheme. A3, A5, A7, A9 (2016 (2017) etc.